1.1 None. This protocol provides a system for creating a unique identifier for each bridge element other than the deck. 2.1 Equipment: PRE-PL-LO-004, Personal Health and Safety Plan. 3.1 Assign a unique identifier to each element of the bridge superstructure and the substructure using the system described below. The unique identifier is a combination of alphanumeric characters, with the number and sequence of characters depending on the type of element being identified. Figure 1 shows an example of the unique identifiers for a two-span continuous bridge with five lines of girders in each span and diaphragms between the girders at the one-quarter points and over the pier. Figure 1. Illustration. Element Identification System—Girder Example. 3.2 Spans: The span number is the first character of the identifiers for the elements that comprise the superstructure. Spans are numbered sequentially, proceeding from the coordinate system origin along the x-axis in the positive direction. The span nearest to the deck origin is span 1; the next span proceeding along the x-axis is span 2; and so on until span N, where N is the total number of spans in the bridge. 3.3.1 The first character is the span number. 3.3.2 The second character is a letter, identifying the girder line. “A” is the girder line closest to the deck origin; “B” is the next closest, etc. 3.4.1 The first character is the span number. 3.4.2 The next component of the identifier is “Di” plus an integer, identifying the diaphragm line number. Di1 is the diaphragm line closest to the deck origin; DiN is the diaphragm line in the span farthest from the deck origin. 3.4.3 When the superstructure is continuous over a pier and there is only one diaphragm line at the pier, that diaphragm is identified as the Nth diaphragm in the span with the lower number. 3.4.4 The last two characters are letters, identifying the two girders to which the diaphragm is connected. 3.5.1 The first character is the span number. 3.5.2 The second and third characters are letters, identifying the two girders to which the secondary member is connected. 3.5.3 The last component of the identifier, preceded by a dash, signifies the type of secondary member. For example, a wind brace (WB) between girders A and B in span 1 is identified as 1AB-WB. 3.6.1 The first character is the span number. 3.6.2 The second and third characters are letters, identifying the two girders that are the sides of the bays. 3.7.1 The first character is an integer and identifies the span number. 3.7.2 The second character is a letter, identifying the exterior girder closest to the overhang. 3.7.3 The third character is always the letter “Z,” indicating the defect or instrumentation is on an overhang. The letter Z has been chosen to denote overhangs because most girder bridges will not have more than 25 girder lines. 3.8 Abutments: The abutment nearest to the deck origin is abutment A; the other abutment is abutment B. The deck origin is used to set the orientation of the wingwalls. For abutments, the right wingwall is closest to the deck origin, while the left wingwall is farthest from the deck origin. 3.9 Piers/pier caps: Piers are numbered sequentially, proceeding from the deck origin along the x‑axis in the positive direction. The pier nearest to the deck origin is pier 1; the next pier proceeding along the x-axis is pier 2; and so on until pier N, where N is the total number of piers in the bridge. 3.10.1 The first two characters are the identifier for the pier. 3.10.2 The last two characters are the letter “C” and the column number. 3.10.3 The pier column nearest the deck origin is pier column 1. The first pier column located closest to the deck origin is identified as “P1C1.” In the case where piles are visible or there are multiple rows of pier columns/piles, identification starts at the column/pier nearest the deck origin and proceeds along the y-axis until the end of the row. Identification continues to be numbered in this manner for each row of columns/piles. 3.11 Joints: Joints are identified by their respective abutment or pier. 3.11.1 The joint at abutment A is joint A, and the joint at abutment B is joint B. 3.11.2 The joint at pier 1 is joint P1; the joint at the next pier proceeding along the x-axis is joint P2, and so on until joint PN, where N is the number of piers in the bridge. 3.12 Bearings: Bearings are identified by a letter, identifying their location on an abutment or pier along the y-axis. 3.12.1.1 The first character is a letter, identifying the abutment. 3.12.1.2 The second character is a letter, identifying its location along the y-axis. The bearing at abutment A nearest to the deck origin is bearing AA; the next bearing proceeding along the y‑axis is bearing AB, and so on. The bearing at abutment B nearest to the x-axis is bearing BA; the next bearing proceeding along the y-axis is bearing BB, and so on. 3.12.2 The identifier for bearings at piers takes the form of “bearing P1A,” where the first two characters identify the pier number, and the last one or two characters identify its location along the y-axis. 3.12.2.1 When two adjacent spans are continuous for dead load, the pier has one bearing line, as shown in the example in figure 1. The bearing nearest the x-axis at pier 1 is bearing P1A; the next bearing proceeding along the y-axis is bearing P1B; and so on until bearing P1N, where N is the total number of bearings on the pier. 3.12.2.2 When two adjacent spans are simply supported, the pier has two bearing lines. 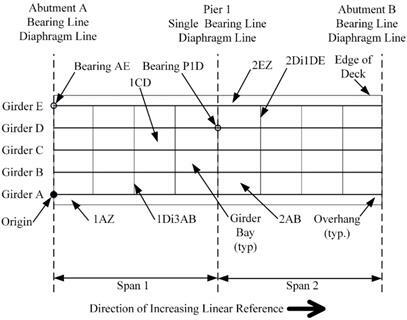 When a pier has two bearing lines, the bearing numbers at pier 1 have an additional labeling component consisting of the integer 1 or 2 at the end of the bearing number. The bearings in the first bearing line (the one closest to the deck origin) are bearings P1A1 through P1N1; the bearings in the second bearing line at pier 1 are bearings P1A2 through P1N2. 3.13 The following describes the segmentation of the two-span continuous bridge shown in figure 1 using the system described above. Items marked with an asterisk (*) are not assigned a unique element identifier. 6.1 It is not practical to use the rectangular coordinate system on the top of the deck (FLD‑OP‑SC‑001, Data Collection Grid and Coordinate System for Bridge Decks) as a basis for locating, measuring, and documenting defects or placing instrumentation on other elements of the bridge, including abutments, wingwalls, pier columns, pier caps, joints, bearings, girders, diaphragms, secondary superstructure elements, girder bays, and deck overhangs. For these elements, it is more practical to have an identification system that creates a unique identifier for each individual element. The identification system assigns each individual element a unique identifier consisting of a specific combination of whole numbers and letters. 6.2 The origin of the rectangular coordinate system for the top of the deck is the starting point for numbering and lettering of elements. Refer to FLD-OP-SC-001, Data Collection Grid and Coordinate System for Bridge Decks, for a description of the coordinate system and for the location of the coordinate system origin. 6.3 Web stiffeners, both vertical and longitudinal, are not assigned a unique element identifier; they are considered part of the steel girder element.